Home/Posts/Hybrid Cloud: Is it really the next big thing? Hybrid Cloud: Is it really the next big thing? It kinda numbed my head. But they all had one thing in common: Hybrid cloud. Running a quick Google search about hybrid cloud tells me this: An integrated cloud service utilizing both public and private clouds- you get the benefits of both on-premise and cloud. This blog is an attempt to understand the Hybrid cloud and untangle the news about the players. Your management tells you, “We are on the verge of market disruption..” and you say, “great!”. Let’s assume, your organization is on the verge of disrupting your target market. This requires you to carefully manage your IT infrastructure and its expenditure. How do you go about optimizing your infrastructure while cutting costs? There are awful lot of steps that can give results for these. 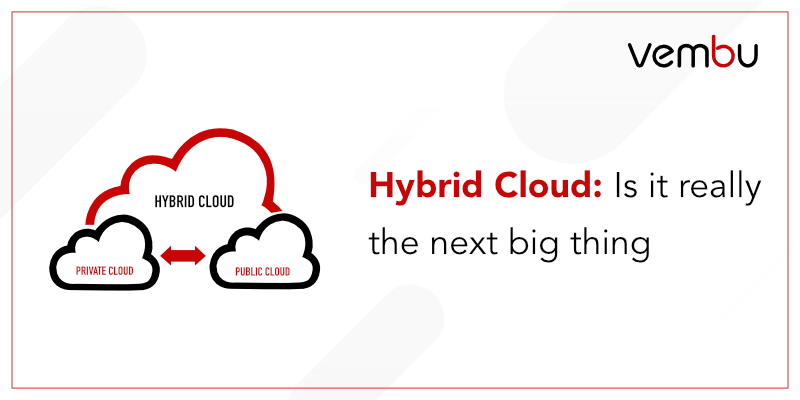 One such, increasingly popular, strategy to increase your operational efficiency with reduced costs is called hybrid cloud. Scalability is a necessary hurdle that you need to cross for success. Public cloud has always been a sensible option for that. You can rapidly provision and deploy storage, computing, and other resources across environments on a pay-as-you-go model. It will be a seamless transition and at a far lower price at that. There’s this quirky old story that was going around on the internet about a couple of engineers at a pharma company. They wanted to analyze a new drug and when approaching the IT team, they were quoted at $100,000 for 6-9 months. They decided to take a different path. Using their credit cards they approached a public CSP and finished their entire project within a month at less than $5000. They were praised, awarded and celebrated for saving the company from massive expenditure…. and fired the next day. Turns out they had breached many company policies and regulations by using sensitive data in a public cloud. The story (true or not) sums up the pros and cons of public and private cloud. When you bring the public cloud into the equation, it’s going to drag all its problems with it- Security & Compliance. Your on-prem data center could deal with data security and regulations way better. All your sensitive data goes to your private cloud while other data goes to the public cloud. Having only critical data in your own data center and going for the pay-as-you-go model in public clouds, you have saved a lot of money for your company. Even if your management’s market-disruption doesn’t pan out, you haven’t shelled out a lot by setting up your private datacenter. You decide to distribute your entire infrastructure across public and private clouds. What you have just thought of is called Hybrid Cloud. In 2019, there is a spike in the adoption of using both public and private across industries: Banks that are modernizing apps and services for their mobile customer base, Healthcare providers that are securing patient details in their cloud while going for flexible deployment of apps using public cloud services and Media houses that process videos in public cloud before using it across their newsrooms, etc. The benefits are clear and the hubbub is justified. With these words, Azure Stack was launched for the first technical preview in early ‘16. It will get them another year and a half to make it ready-to-order. Riding on the success of Azure and the huge enterprise base, they had a head start in the cloud race that the other players are still struggling to catch up. For the past 8 years, Azure has been growing its base steadily. Recently, Microsoft has been aggressively pushing its enterprise customers to move their on-prem workloads to the cloud. It was the right time for public clouds. With the growing fervor around the term cloud, only three more words were required to evangelize any IT team: Flexibility, Scalability, and Pricing. More than a decade ago, the idea of scaling your setup meant adding more servers. Then, Virtualization happened (Microsoft was also the second biggest player there: Hyper-V). People could run multiple machines from a single server. So, scaling was easy then? Nope. Turns out, after a point the overhead of your servers, the cost and the very idea of maintenance was tiring. The idea of running your workloads on the cloud was the perfect solution for all this. Microsoft looked at this upcoming need, looked at the scope and looked at their stack. They decided to go all in. It’s no spoiler that Azure did become a big thing. Expanding and having presence in over 40 countries across the world then, Microsoft was achieving what it set out to do…until the thought “What about our compliance laws?” popped up. “We will only start this journey with you if you can put all the infrastructure we need on our premises, isolated from the internet, so we can be assured of security, of governance, of adequate latency for decision making” – An Industrial IoT firm said to ABB who then dutifully forwarded the requirement to Microsoft. The need for Azure Stack was clear. An on-premise setup that would offer a subset of the cloud services with a similar portal, thus overcoming the need for training and implementation. Along with control and orchestration over the workloads. This brings us to the early ‘16 when Azure Stack was launched for preview and then later for general availability. There were two targets. The first being their existing enterprise market. It is easier to get Azure Stack to companies that are already exposed to Azure and have been using Microsoft products since the dawn of time. The second step was to get their partners to set up this box-on-premise hybrid cloud kit effectively extending their Azure outreach. But Microsoft was not the only cloud player in the market. There was a bigger juggernaut: Amazon. “This essentially meant, “hang on; the AWS cavalry is coming for your on-premises workloads”– Atelesk, 451 Research. At re:Invent at Las Vegas, AWS announced that it was teaming up with on-premise virtualization giant VMware in what is hyped up to be the biggest takedown in ‘the cloud wars’. AWS and VMware have partnered before where VMware Cloud could be run on AWS. But this time, Amazon is doubling down by bringing in their own version of Azure Stack, called AWS Outposts- using which you can run the AWS cloud services on-premise; along with running VMware Cloud on AWS locally. Like VMs, containers have also gained (still gaining) traction. Google decided to tap into this by doing a live demo at their event Google Cloud Next by running Google Kubernetes Engine on top of VMware vSphere. Recently, with the rise of containerization, there has also been an increase in orchestration platforms for these containers. GKE is built for a future where the enterprise environment has containers and instances across public and private clouds- a point at which easy orchestration that simplifies everything is key. We are at a point where tech giants are battling over cloud dominance through reach, innovation, and usability. Which player you go for doesn’t matter in the long run as IT infrastructure across all business-sizes will go for this hybrid model, as it makes running your systems easier, safer and cheaper. Move towards hybrid is inevitable because of its benefits. While that is happening, an attempt should be made to not get carried away about the vulnerabilities. Trusting whether your data is safe is secondary; the question is whether the data is safe from you? It has been proven by many that configuring AWS Storage incorrectly is possible, which exposes your data (read: critical files) to the internet. Replication of your instances in the cloud is not going to be very helpful against malware. Users make mistakes, disks crash and data gets corrupted. Trusting the hybrid cloud model and protecting your data are two different things. There is a simple solution that has been around far longer than this tech has been around: Backup and Recovery. Define your target Recovery Time Objective (RTO) and Recovery Point Objective (RPO). Make sure your backups are recoverable. Look for different types of recovery. Plan for Disaster Recovery. Try Vembu BDR Suite for a 30-day free trial period.